Six Months Later is a monthly series that looks back at people, events and issues that were in the news half a year ago. This series appears on the last Monday of every month. 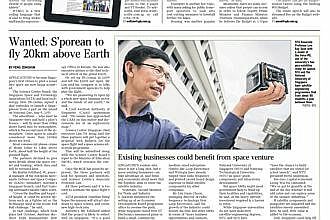 The bold plan to send a Singaporean into space in 2015 is on track, according to one of the key drivers of the project. IN.Genius director Lim Seng told The Straits Times that seven unmanned flight tests have been carried out overseas so far. He declined to reveal more, including whether the plan involves a craft that looks like a plane or a giant balloon, citing confidentiality agreements. But he said a vessel for two which will fly more than 20km into the Earth's stratosphere - most commercial planes fly 10km to 12km above the planet - will be launched in 2015 on National Day. A commercial version of the vessel, which will be able to hold about four to six passengers, will be ready the following year, he added, as part of a programme to kick-start Singapore's space tourism industry by 2016. "We have a business plan and we are confident that our effort to launch space tourism here will create revenue, high-tech jobs and open up a new business sector for Singapore." The privately-funded scheme, which also has the backing of the Singapore Space and Technology Association (SSTA), has its doubters. Professor Chew Yong Tian, from the National University of Singapore's department of mechanical engineering, described the 2016 space tourism plan as "ambitious", noting that there are "many other considerations such as commercial viability, safety and attraction to tourists". But SSTA president Jonathan Hung said he believes that they will be able to meet the deadline, without compromising safety. He added: "Singapore has the right ingredients to build such an industry and we should capitalise on our strengths to realise it." Commercial space travel has yet to become a reality, but British billionaire Richard Branson's Virgin Galactic, which has been selling US$250,000 (S$316,000) tickets on its spaceplane, hopes to have its first launch next year. Spanish firm zero2infinity is also purportedly ready to offer commercial flights using giant helium balloons in the next two years. Meanwhile, the race to be chosen as Singapore's first space traveller is heating up. More than 120 applicants, 90 per cent of whom are Singapore Airlines pilots, have sent in their bids since a call for entries was made in late February. The deadline for applications has been extended to Sept 30. "We want to have a bigger talent pool to draw from," said Mr Lim, adding that he hopes more pilots from the Republic of Singapore Air Force will also sign up. Applicants should have a pilot's licence, but that has not stopped Tanjong Katong Girls' School student, Cherie Lim, 15, one of five female applicants. She said: "Space is truly amazing. There are so many new discoveries waiting for us."